Yep, I’m back again with the brown sweater and a book I’m only sort of reading. I don’t even have an entertaining story about a rubber chicken to share with you this week (although you’re welcome to scroll down and read last week’s story about a rubber chicken). Even the slanting evening light in this photo is a cliché. 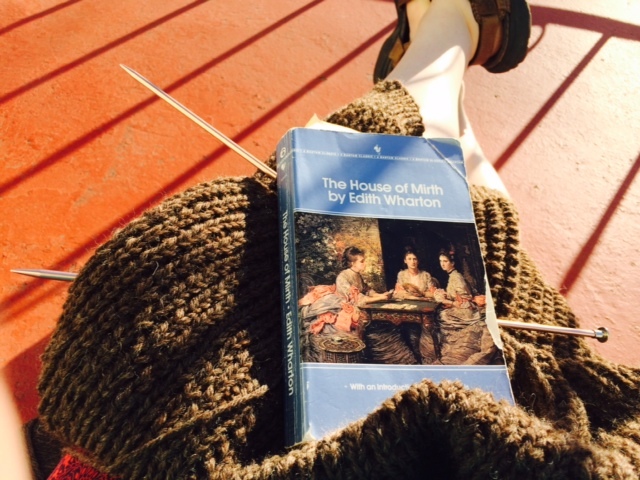 I have, however, read a few chapters of The House of Mirth, which is almost exactly like The Portrait of a Lady, minus about 300 pages and a couple hundred uses of the word ‘desultory.’ Like Isabel Archer, Lily Bart is ‘poor,’ which means that she employs only a couple of dressmakers. Everywhere she turns, she meets another possible suitor – it’s like an episode of Seinfeld that way – and she hasn’t chosen yet but it’s a guarantee she’ll marry the wrong one. Not to give away the ending or anything. Oh, and one more thing – there’s a character in it named “Mrs. Peniston.” Yes, really! 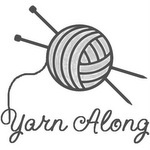 This entry was posted in Yarn Along and tagged Edith Wharton, knitting, knitting sweaters, The House of Mirth. Bookmark the permalink. The sweater looks like it’s going to be really comfy cozy when finished. I laughed when I read, …”she hasn’t chosen a suitor yet but it’s a guarantee she’ll marry the wrong one. ” I read it to and that’s a very accurate observation! Thanks! 19th and early 20th century marriage plot novels are so predictable! I love your book review. Peniston, indeed. I’m sure it’s pronounced pen-iss-ton, but it cracks me up anyway, because I am 13. The sweater looks like it is coming along well, and will be great in the fall and winter. Thanks! I actually read it as “Penn (rhymes with ten) -iston for the first few chapters before I happily discovered what word was buried in there. It’s fun to be 13. Yes, that was what I meant – pen rather than peen. Another favorite of ours is a regional restaurant here called Phu-ket. Poo-kay. Which is now what we say when we mean something else. Whatever! Phu-ket! Yes, we have a restaurant here by the same name. I remember how hilarious it was when I first noticed it as a kid!